Is My Prayer Good Enough? Dear Sisters, my prayer experiences don’t seem good enough or holy enough, long enough or intense enough. Do you have any suggestions as to how I can pray better? First of all, I suggest not using the expression “prayer experiences” at all. Hit the delete button on that one. A lot of people tend to speak about their prayer experiences. To me, it’s not the best choice of words. I believe that to use the expression “prayer experience” lessens, or taints my prayer. Prayer isn’t just “an experience.” It is so much more. All these definitions are right and good – in their proper place, but not for a description or explanation of prayer. Why? To Carmelites, prayer is relationship. It is time spent with Someone you love. It is that coming to know Another in a deeper way – to pray is to speak and then to listen; to communicate on a more personal and profound level and to grow in understanding, respect and appreciation of the other. St. Teresa of Avila puts it this way. “Prayer is nothing else than an intimate friendship, a frequent heart-to-heart conversation with Him, Who we know loves us” (Life, viii). Not good enough or holy enough? Not long enough or intense enough? It is one way of looking at it, but it makes me think of asking you a question. What does love look like? Does it not have a thousand faces? The face of love can sit quietly in sorrow, sympathy, and compassion. Or it can radiate with joy and laughter and grimace in steadfast, faithful determination. When someone truly falls in love, I don’t think there should be, or are, such questions. They minimize and actually detract from the power of loving. To be with, to share with, to companion the One you love is love. Love is more than an experience. Well, love is love. A. God made me to know Him, to love Him, and to serve Him in this world and to be happy with Him in the next. That is a very personal answer, it seems to me. It summarizes the reason for our existence. I am reminded of a phrase in our profession of vows when we make our perpetual profession to God. The entire formula of vows is very beautiful, but the expression that comes to mind right now is the following – “in intimacy with God through prayer.” Yes, that’s it. That says it. There is a four volume book set, Divine Intimacy by Father Gabriel of St. Mary Magdalen, OCD. It is a Carmelite classic on prayer. The original was one thick book and has now been broken down into the four volume set. Note the name. It is the same concept; however Father Gabriel doesn’t say Divine Relationship or Divine Friendship. No, his classic goes straight to the core, the height, the goal, which is intimacy. Just to meditate on this thought is a very fruitful meditation. So, now to come more directly to your question, you don’t need to feel holy, or good, or have any particular feeling. A dad doesn’t feel good getting up before dawn to get ready to go to work. A mom doesn’t feel good about taking care of her children when she herself is ill and would rather be in bed. A nun doesn’t feel so great, either, getting up before dawn to pray. But, ah! This is love. We do this out of our love, for the one we love, and ah!…that also is prayer. I think we could sum up St. John of the Cross by saying that it is our WILL which chooses what we see, what we hear, what we do. Our will is at work when we pray. We can will to pray when we don’t feel like it, just as in the examples above of the dad or mom or nun. We’ve heard the expression “suit up and show up.” We can use it, also, for prayer. And if we “suit up and show up” on a daily basis, on both good days and bad days, I would add, that, then, would be a powerful prayer, indeed – the prayer of a friend, who comes to be with God not looking for any gain or consolation, but is content to be with God. Art for this post “Is My Prayer Good Enough?”: Shield for the Carmelite Sisters of the Most Sacred Heart of Los Angeles, all rights reserved used with permission. 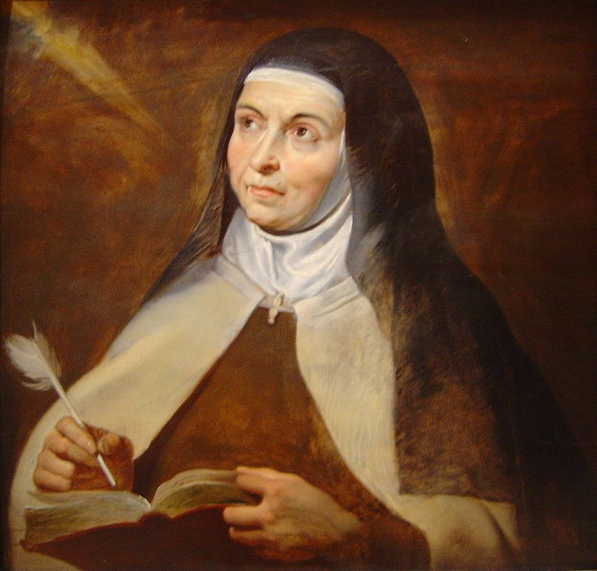 Teresa of Avila, Peter Paul Rubens, 1615, CCA-SA 3.0 Unported; St. John of the Cross, Francisco de Zurbarán, 1656, PD-US author’s life plus 100 years or less; both Wikimedia Commons.